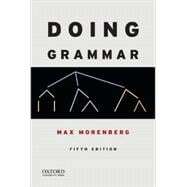 Doing Grammar is a practical and lively guide to discovering how the English language works. Using strong visuals and an engaging style, Max Morenberg builds upon traditional frameworks with modern linguistic theories and provides accessible explanations for the composition of sentences. Now in its fifth edition, Doing Grammar includes up-to-date examples and features, while retaining its unique voice. Max Morenberg was Professor of English Emeritus at Miami University of Ohio, where he codirected the Ohio Writing Project. Prepositional Phrases Headed by "With"
Infinitive Phrases Introduced by "For... To"
10. What Can You Do Now That You Can Do Grammar?